Readers, lots of folks have enjoyed Chatpers 1-2 of The Eye of Adoption! Thank you for spreading the message! Today, I add Chapter 3, "Blueprints for Footprints." (Remember, I’ll be back to my humor theories December 6.) I can't wait! I thought I'd enjoy the break from creative writing, but I miss it. 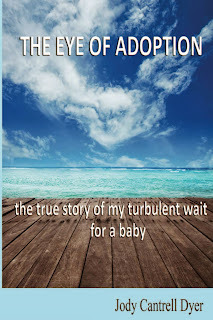 Until December, my writing efforts are focused on promoting adoption as a modern, healthy option for creating families and helping men and women facing crisis pregnancies. Each Friday in November, I'll post an additional chapter. I’ve also teamed up with other adoption authors to give our books away throughout the month. Be sure to check the links at the end of each post for information on how to receive other authors' download dates. This weekend (November 15-17), you can download The Eye of Adoption FREE on Kindle or with the Kindle App. Authors earn no royalties on free download days. Adoption authors particularly love to give their work away! See you next Friday with Chapter 3! Until then, think outside the barn.